Black beard algae, hair algae or brush algae (Audouinella sp., Rhodochorton sp.) belong to the group of red algae – despite its classification, the appearance to us is commonly black – hence its well thought out name. It is the most difficult algae to get rid of – but there is now a very easy way !!! The root cause of black beard algae is an accumulation of nutrients in the aquarium. Basically black beard is caused by giving fish too much food vs not changing enough water giving an extremely high (and deadly to fish!) reading of nitrates in the water. Black Beard algae is found in any kind of freshwater fish tank – both tropical or cold water. It occurs in densely planted aquascapes, in tanks with a high stock of fish and tanks with only several plants or no plants at all. Black Beard Algae is not harmful to fish but to plants it is damaging as it spreads and covers the plants leaves reducing photosynthesis. Unknown to many there is a very easy way to quickly rid your tank within a week or two of this horrible imposter to your aquarium. 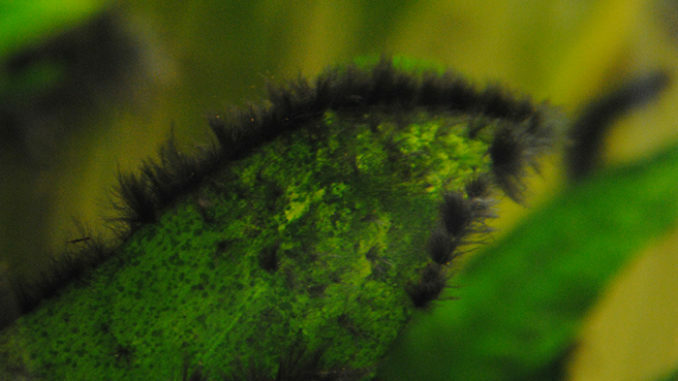 If there is a very high presence of black beard algae – ie the aquarium is significantly overgrown, then it is best to manually pull out what you can before starting anything. Just grab clumps and firmly pull them removing what you can. Remove any carbon or bio chem zorb products from the filter. Let everything settle for 24 hours. 1) Add 10ml of Flourish Excel per 40L of aquarium water. Sometimes it will take longer than a week to remove all of the Black Beard Algae, commonly it takes between 10 and 21 days to completely erradicate from an aquarium. Please note that invertebrates such as yabbies, shrimp and fish species such as Corydoras varieties do not like high dosages of the product and can fall victim to its presence. Also note that if you accidently overdose the dosage of Flourish Excel to what is written above then immediately complete at least a 50% water change. Disclaimer: The information provided here is of a general nature only. There are site specifc factors that are not addressed here that may also affect the health and well being of your fsh, as such Aquarium Fish Paradise will not be held liable for the performance of your fish.